Independent TD Maureen O’Sullivan said while she was in Iran, the Irish embassy closure was brought up repeatedly in meetings. 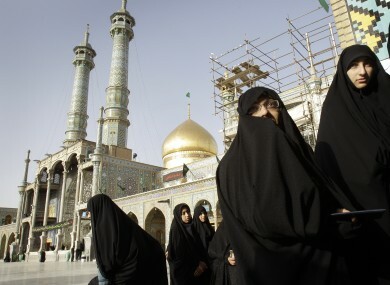 (File photo) Iranian women queue to cast their ballot for the parliamentary elections at Masoumeh shrine in the city of Qom. INDEPENDENT TD MAUREEN O’Sullivan has said that the decision to close the Irish embassy in Iran was a “big mistake” stating that while she was on a diplomatic trip to Iran recently it was raised repeatedly. Speaking to TheJournal.ie after her trip, she said there is “no doubt in my mind that closing the embassy in Iran was a big mistake. It is always good for diplomatic relations to have a presence in countries. I think it was very short-sighted,” she said. O’Sullivan said that embassy closure was “looked upon as a slight” adding that the issue was raised in each meeting they had. “We had to reassure the Iranian officials constantly that it was for economic reasons that it was closed and it was not for any other reasons, but I have my doubts,” she said. She added that she did make a point of it at the Foreign Affairs Committee. Yesterday, the Government announced that it is to reopen its embassy at the Vatican as part of a wide-scale reorganisation of Ireland’s diplomatic missions abroad. It was closed 26 months ago, as was the Iranian embassy and the Irish embassy in East Timor. In a statement, the Tánaiste and Minister for Foreign Affairs Eamon Gilmore said new embassies in Nairobi, Zagreb, Jakarta, and Bangkok as well as The Holy See. There will also be new consulates in Austin, Hong Kong and Sao Paulo. All of the new offices will have a staff of between one and three people. There was no mention of the Iranian embassy. Gilmore added that while there are 300 diplomats promoting Ireland’s economic and strategic interests in 73 locations abroad, countries like Norway, Finland, Denmark and the Netherlands have a far greater global presence which leaves Ireland at a distinct disadvantage when trying to compete in both emerging and established markets, he said. In a meeting with the Iranian Human Rights Commission we had a frank discussion about the women’s rights, the death penalty, prisoners, rights for gay and lesbian people, drugs and stonings. “Human rights was very much on the agenda,” she said, adding that it was “hard to believe” the reasons given by the Taoiseach Enda Kenny as to why he didn’t raise human rights issues during his trade mission to Saudi Arabia trip in the first week of January. Email “‘Iranians look upon the closure of the Irish embassy as a slight’”. Feedback on “‘Iranians look upon the closure of the Irish embassy as a slight’”.